There’s a million reasons why I love Vancouver. Besides the (very obvious) fact that it’s the city where I was born and raised, there’s also the crazy food scene, the grammable skyline and natural beauty that will melt even the coldest of hearts. Given this undying love, I’m always thrilled by the chance to show it off to anyone new. Well, last month gave me the ultimate test: my boyfriend was visiting Canada for the first time, and obviously, I was determined to convert him into a Vancity fanboy. Being his first visit, among all my grand plans of stuffing him with Tim Horton’s, poutine and sushi, I also wanted him to have a taste of the city’s best everything. So naturally, I needed to pick the perfect hotel to kick off his visit. 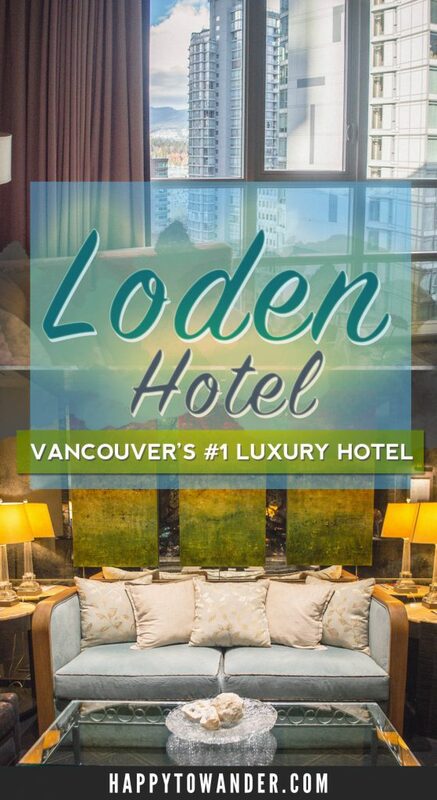 After a quick Google for “Best hotels in Vancouver”, I came across the Loden Hotel in downtown Vancouver, declared the #1 hotel in the city by Condé Nast Traveler last year. So what does it take to be #1? Here’s a review of my experience! 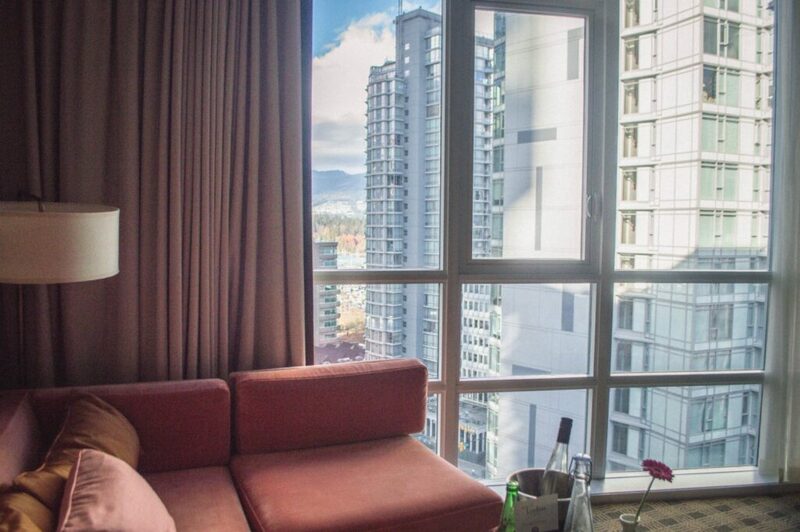 Located in the heart of Vancouver’s downtown core, the Loden Hotel is within easy walking distance to the city’s shopping and nightlife hubs, plus dangerously near to countless food options that cater to all tastes. The crazy thing about Vancouver is that you can get Japanese hot dogs, liquid nitrogen ice cream and Greek takeaway all on one block… and the Loden will put you within arm’s reach of this culinary action. (Good thing their beds are ideal for food comas). Now, for attractions a bit farther away, the Loden is also only steps from public transit (like buses and the Skytrain), which will easily whisk you off to the city’s main sights like the beach and Stanley Park. As a scarily eager tour guide/pro power walker, I was able to give my boyfriend the grand tour of Vancouver’s best sights completely by foot, and the Loden’s central location made that a lot easier. What’s great is the hotel is tucked away on a quiet street, which means you’re close to the action without being disturbed by all the noise. Truthfully, I got good vibes from the Loden as soon as we walked through the door. The decor throughout the hotel is modern and sleek, with punchy pops of colour in both the lobby and rooms. It was late in the evening and we had just gotten off a plane from Los Angeles, so this cool & beautiful hotel was a sight for sore eyes. 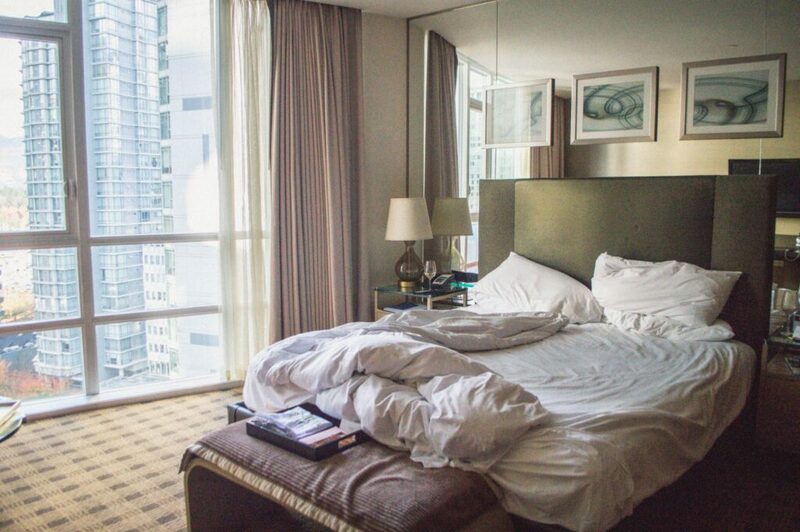 We stayed in a Loden Signature Room, which had everything we needed for a great night’s rest. As we swiped our keycard and walked in, I knew right away that I was in love. Rather than just checking into a hotel room, it felt like I was coming home to my ultra cool downtown apartment. The rich dark wood decor was right up my alley, there was subtle mood music playing in the background and to top it all off, the room smelled amazing. I could tell immediately that they were paying close attention to the details, and I was sold. 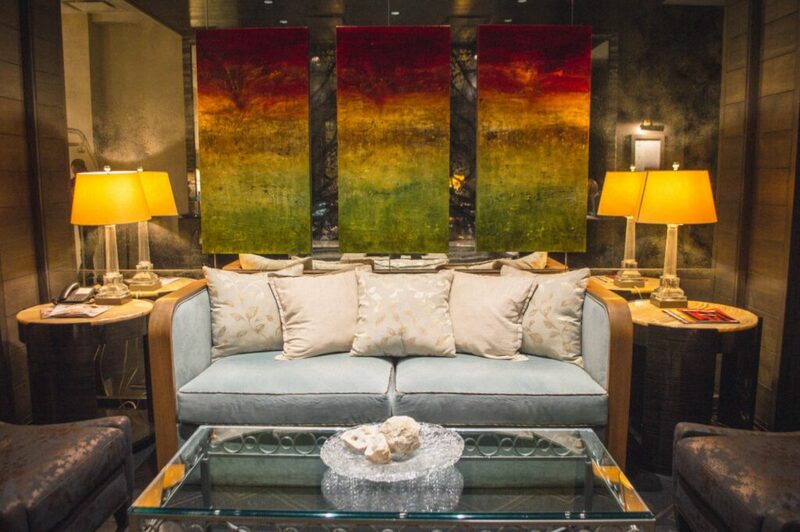 It didn’t take long for us to realize that comfort is a clear priority at the Loden. I mean, this is a place that has pillow options, guys. So if you’re a buckwheat kinda person (or are curious about what that even means), then know that the Loden has you taken care of. There’s also gorgeous floor-to-ceiling windows that overlook the city, and a movable wall for the bathroom that opens it up to all the bright, natural light your heart desires. The room was compact, but had everything we needed, including desk space and a sectional couch. Their signature rooms come with a variety of bed arrangements to suit different needs (king, queen double) and of course, suites and a killer penthouse too if you’re looking for an upgrade. Call me biased, but Canadians are some of the nicest people you’ll ever meet. This was clear with the staff at the Loden. Everyone we encountered was not only nice, but syrupy sweet and genuine. To me, that’s one of the perks of staying at smaller boutique hotels. Staff seem to go the extra mile to ensure each guest’s experience is perfect. Because of our late arrival and early morning checkout, we weren’t able to take full advantage of the Loden’s long list of amenities. I know, guys, it hurt me too. 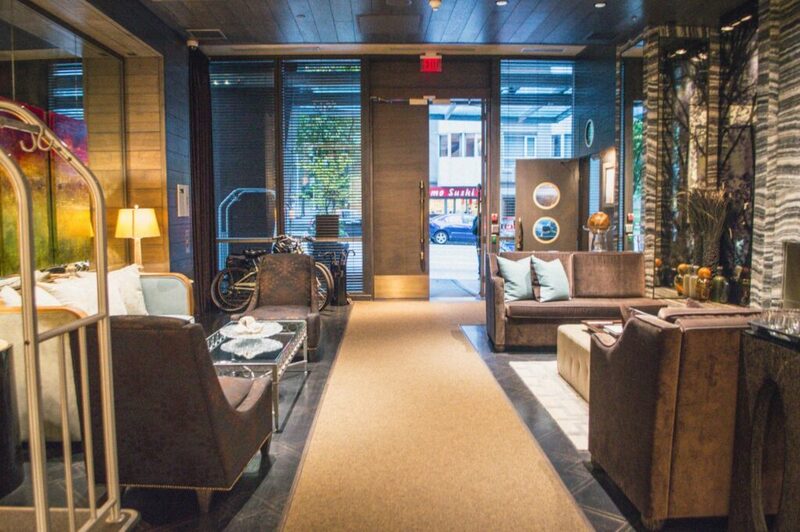 But, it’s worth mentioning that guests at the Loden gain access to a variety of cool perks, including the ability to rent cruiser bikes free of charge (bottled water, map and helmet included), and make use of a complimentary downtown drop-off service that will drive you to different areas in the downtown core. As a very Vancouver addition, there’s also yoga mats provided in each room, a 24h fitness studio, and guided hikes/rides as part of the hotel’s WanderFIT program. Those looking for a more chilled holiday though can take advantage of the Loden’s spa/sauna and the in-house Tableau bistro, which puts a West Coast twist on French bistro cuisine. I’ve heard great things about this place, and would love to head back and give it a try! The Loden Hotel is a modern, luxurious and comfortable hotel with stellar service and a first class ambiance. Add in a very central downtown location, and to me you have a perfect hotel. I was thrilled that I got the chance to welcome my boyfriend to the city in such a stylish way, and as cliched as it might be, my one complaint is that we didn’t get to stay longer. 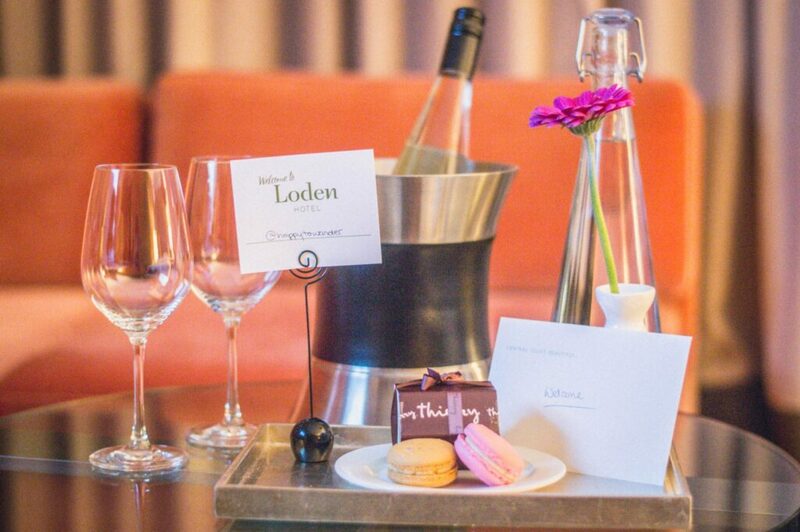 The Loden does luxury well with a modern West Coast twist, and I would definitely recommend it for anyone seeking a special experience in Vancouver! PS: This post contains affiliate links, which means I earn a commission when you purchase from them. Thanks as always for your support! Ah, so jealous of all the hotels you’re staying in. The design of the bed makes it look super comfortable! Wow, I can see why this hotel was rated #1! Such a nice view of the mountains and part of the Harbour. That’s awesome that guests have access to all of those perks too… I would totally love to stay there during the summer months! I have always loved hotels that are very tall, with ceiling to floor windows from where you can admire the endless panorama of the city. 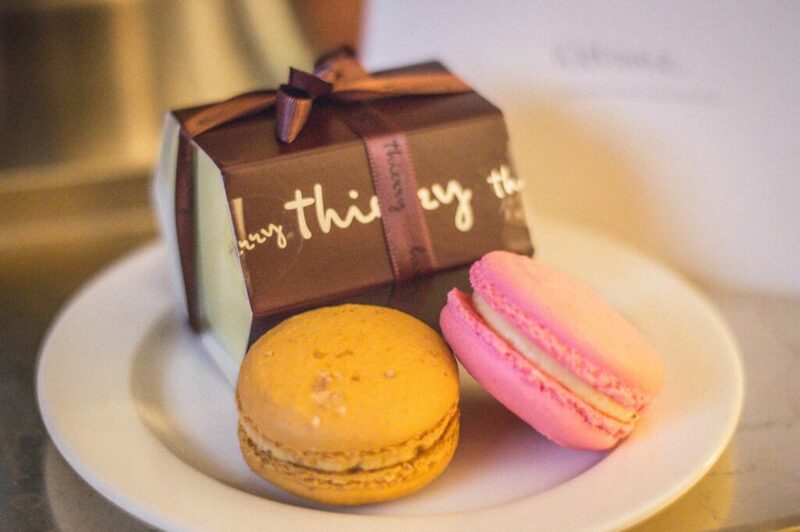 The bed looks so comfortable and it was so nice of them to welcome you with the macaroons. Yes! Natural light is such a big thing for me!! and haha yes they easily won my heart with the sweets 😉 thanks for reading, Joanna! Love the welcome wine and cakes. It’s true that Canadians are really warm and welcoming people. Whixh is why us Australians are so happy to have them come over here. Hehe can’t argue that we Canadians are the best 😉 To be fair, we love you Aussies too!! Thanks for reading, Jean. It looks lovely. I love all the little touches — cruiser bikes, yoga mats! i will bookmark this for the next time I get to Vancouver. Hope your boyfriend became a convert! Oh he most certainly did 😉 thanks for reading, Mel! It looks amazing! It is so important for hotels to feel like home and comfortable, so this one has that nailed down like a T. Love to stay there if I ever make it to Vancouver. yes, hominess (if that’s even a word haha) is such a difficult thing to nail down, especially with big hotels, so I was really pleasantly surprised by the Loden’s awesome vibe 🙂 thanks for reading, Naomi! Sounds (and looks) like a very wonderful place to stay. If only we could afford luxury accommodations all the time, but seeing how beautiful the rooms and amenities are, you understand that it is truly worth the price. Sometimes the splurge is worth it, hey? 😉 thanks for reading, Abigail! Yay!! I hope you have an amazing time, Sabrina! The hotel looks interesting, your site looks really nice. I love all the places, beautiful rooms! It is a wonderful place. I really loved it so much!! 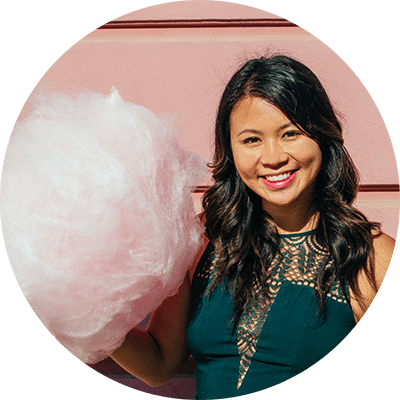 Awesome – thanks for reading Vanessa!